BUNNING, James Paul David, a Representative and Senator from Kentucky; born in Southgate, Ky., October 23, 1931; attended parochial schools in Southgate and Cincinnati, Ohio; B.S., Xavier University, Cincinnati 1953; professional baseball player 1950-1971; investment broker and agent; member, Ft. Thomas City Council 1977-1979; Kentucky State senate 1979-1983; elected as a Republican to the One Hundredth and to the five succeeding Congresses (January 3, 1987-January 3, 1999); not a candidate for reelection to the House of Representatives in 1998, but was elected to the United States Senate in 1998; reelected in 2004 and served from January 3, 1999, to January 3, 2011; was not a candidate for reelection to the Senate in 2010; was a resident of Fort Thomas, Ky., until his death on May 26, 2017; interment in St. Stephen Cemetery, Fort Thomas, Ky.
Bunning, Jim, and others. Grand Slam: The Secrets of Power Baseball. New York: Viking Press, 1965. Bunning, Jim, with Ralph Bernstein. The Story of Jim Bunning. Philadelphia: Lippincott, 1965. Dolson, Frank. Jim Bunning: Baseball and Beyond. Philadelphia: Temple University Press, 1998. U.S. Congress. 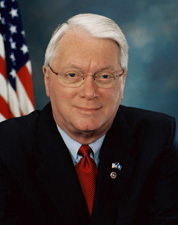 Tributes Delivered in Congress: Jim Bunning, United States Congressman, 1987-1999, United States Senator, 1999-2011. Washington: U.S. Government Printing Office, 2012.